I was asked to restore this summerhouse standing in the grounds of an impressive, architect designed, 1930's house near Barton, a village to the North of Preston. I was anxious to preserve as much of the original structure as possible including the unique door furniture. 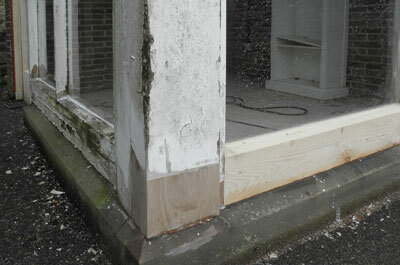 However, as can be seen from the photographs, the summerhouse was in a bad state of repair from extensive wet rot. Typically, the weather damage was concentrated in the lower elements of the structure, where it was so severe that I had to cut away large decayed sections and in one case build an entirely new door. 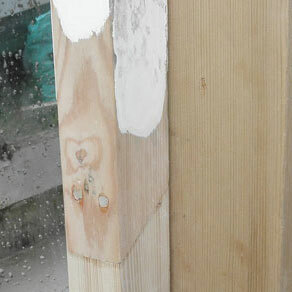 In order to make any repairs invisible I used a scarf joint which is angled so that any new wood can be more discreetly connected to the existing structure. The new wood was treated for weather resistance (pre-vac.) or hardwoods used where this was not possible. The original doors were stripped, including locks and handles, and then rebuilt to the exact dimensions of the original. 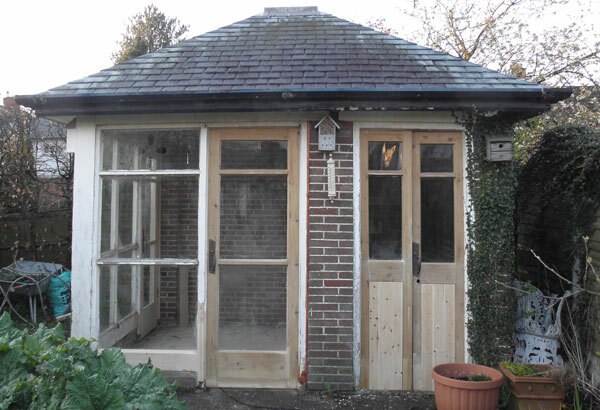 The project took around seven days and the clients, Mr. and Mrs. Pearson, were extremely pleased with the result and are arranging for the building to be repainted to bring this beautiful summerhouse back to its original glory.